Late summer is the time of nature’s richest abundance and we have put this bounty to good use on our Summer Menu. We start with the sweetest of summer fruits: Goma Tofu with Heritage Tomatoes and Robata Peach Salad. Goma tofu is only referred to as tofu to evoke its smooth, light texture; it is, however, made from sesame paste and detoxifying kuzu into pure vegan umami madness, the perfect partner to sweet and tart heritage tomatoes. Peaches take to the robata grill like ducks to water; their tangy juices caramelizing on the grill, intensifying their flavor – cling to last of the summer vine with this succulent salad. Around the world, summer is the time for cleansing and zingy seafood; raw or marinated, from crudo to ceviche, poke to tiradito, Here at Sushi & Robata we provide a sensational, international selection for your delectation with Hiramasa Tiradito and 2 seasonal ceviches: Choose from Octopus or a Trio of White Fish.- or simply order both to share, contrast and compare. Hiramasa, with its silken texture and pinkish hue is an ideal fish for sashimi and therefore, tiradito. Tiradito being the Peruvian equivalent: sliced fine like sashimi and sauced just before serving. We top ours with a dab of truffle aioli, salmon roe, katsuobushi (caramel flakes of bonito) and micro coriander cress; prepare yourself for an explosion of complex flavors. Keep the Olympic spirit alive with these ceviches: a transportative taste relay with its origins in Greek Olympia it’s present in Brazil and its future in Japan. Your choice of Octopus or a white fish medley of Hiramasa, Sea Bass & Lemon Sole marinated in soy, sake, yuzu and chilli served on a bed of crisp raw vegetables. We always aspire to reach new heights with our maki and this season is no different: we proudly present our Salmon Supreme Maki and Shiro Maki. This Is What You Came For: Salmom Supreme Maki. Salmon that is initially hand smoked, then marinated, is accompanied by creamy avocado and a dash of spicy mayo. A hidden pocket of crunch and a drop of eel sauce provide the perfect counterpoint of sweetness to the smoke and spice. This just might outlast the summer. 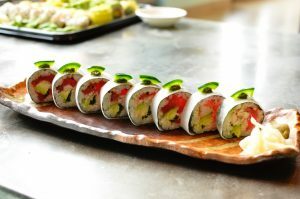 Our Shiro Maki or white roll (wrapped in mooli, instead of nori) is quintessentially healthy but no less bursting with flavour: Tuna, Cornish crab, avocado, chives and chilli crowned by salsa verde and a crescent of jalapeño pepper to add a final flash of summer heat. Ume somen are a traditional summertime Japanese treat: luscious pink noodles that get their color and subtle sweetness from plums, made lavish with Robata aubergine and the constant tingling surprise of Padron peppers. Robata Aubergine and Padron Peppers is a hearty vegan plate of food. • Coconut Coriander Gazpacho – Re-hydration made glamorous, it’s your workout in a glass. • Super Berry Smoothie – All the glory of a milkshake with none of the guilt or dairy. • Tropical Sunrise – A sun salutation; citrus zing to keep the sunshine in your pocket all day.